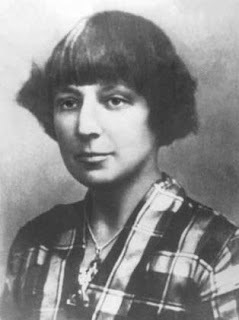 Marina Tsvetaeva was born in Moscow. Her father, Ivan Tsvetayev, was a professor of art history and the founder of the Museum of Fine Arts. Her mother Mariya, née Meyn, was a talented concert pianist. The family travelled a great deal and Tsvetaeva attended schools in Switzerland, Germany, and at the Sorbonne, Paris. Tsvetaeva started to write verse in her early childhood. She made her debut as a poet at the age of 18 with the collection Evening Album, a tribute to her childhood. In 1912 Tsvetaeva married Sergei Efron, they had two daughters and one son. Magic Lantern showed her technical mastery and was followed in 1913 by a selection of poems from her first collections. Tsvetaeva's affair with the poet and opera librettist Sofiia Parnok inspired her cycle of poems called Girlfriend. Parnok's career stopped in the late 1920s when she was no longer allowed to publish. The poems composed between 1917 and 1921 appeared in 1957 under the title The Demesne of the Swans. Inspired by her relationship with Konstantin Rodzevich, an ex-Red Army officer she wrote Poem of the Mountain and Poem of the End. After 1917 Revolution Tsvetaeva was trapped in Moscow for five years. During the famine one of her own daughters died of starvation. Tsvetaeva's poetry reveal her growing interest in folk song and the techniques of the major symbolist and poets, such as Aleksander Blok and Anna Akhmatova. In 1922 Tsvetaeva emigrated with her family to Berlin, where she rejoined her husband, and then to Prague. This was a highly productive period in her life - she published five collections of verse and a number of narrative poems, plays, and essays. During her years in Paris Tsvetaeva wrote two parts of the planned dramatic trilogy. The last collection published during her lifetime, After Russia, appeared in 1928. Its print, 100 numbered copies, were sold by special subscription. In Paris the family lived in poverty, the income came almost entirely from Tsvetaeva's writings. When her husband started to work for the Soviet security service, the Russian community of Paris turned against Tsvetaeva. Her limited publishing ways for poetry were blocked and she turned to prose. In 1937 appeared MOY PUSHKIN, one of Tsvetaeva's best prose works. To earn extra income, she also produced short stories, memoirs and critical articles. In exile Tsvetaeva felt more and more isolated. Friendless and almost destitute she returned to the Soviet Union in 1938, where her son and husband already lived. Next year her husband was executed and her daughter was sent to a labor camp. Tsvetaeva was officially ostracized and unable to publish. After the USSR was invaded by German Army in 1941, Tsvetaeva was evacuated to the small provincial town of Elabuga with her son. In despair, she hanged herself ten days later on August 31, 1941. Now, here, as the day would start! So let me die. Let me depart. Your time's not ripe" you will not say. Yourself you gave me - too much now! I thirst at once - for every way! That each and every day be mad! The minute's trace of soul of mine..
Now let me die at seventeen! Calming.. If but to forget.. but to sleep..
Sweetness of eyelids over eyes..
Clear like a crystal clean. Sorrowful is it to meet!